EC3D is a Canadian and Montreal based compression company who has been in the compression medical field for a bout 15 years. Fit: The socks was easy to slip on and the sock part was easy adjust. The sock has some added padding for extra cushioning but it does not feel bulky. The socks comes in Right/left specific socks to approve fit. I really feel the softness of these socks, it kind of feel like an extra skin. In the past I have had issues with compression socks not staying up for my longer runs. EC3D feels safe and they stay up. I have not experienced any chafing with EC3D socks. The socks are light woven and the socks have been keeping my feet and legs dry. The running I've been doing has been during NJ winter months and I can not comment on the breath ability but I feel that it should not be an issues to use these socks during hot summer months. The compression part have EC3D Seamless Zoned Compression. Its medical gradient and have different zones and pads. The compression is firm and have kind of a soft touch to it. 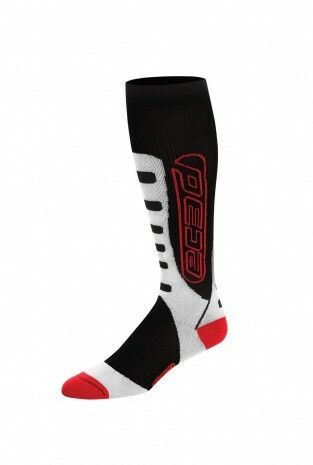 You can feel the different zones of Compression, specially over you front shins and Achilles. With these socks you have a nice soft firm compression that feels secure. The compressions has been tested during long runs up 20 miles, Intervals and tempo runs. During all runs they have stayed up and offered a nice compression. When it comes to durability, the big test comes to if they stay up during long runs after a few times in the washer. Ec3d pass this test great. i feel the same comfort and compression after a few washes. The sock keeps the same fit and form. EC3D is a new brand to me. The company has a wide variety of compression gear to offer for you, including shorts and arm sleeves. As compression I feel the company is up at the top, offering great quality and a nice secure fit. my biggest issues with compression sock is that they don't stay up. With EC3D this is not an issues and I don't have to worry about the them dropping down. Give Away: We have one pair of sock to give away. Simply send your sock size and calf size and answer the question: Who is the ambassador of EC3D? Disclaimer: The product was given to me for free and I haven’t been compensated in any other way by the company. The review is straight up based on my opinions on the product and it has not been controlled or affected by the company mentioned in any way.